We are located on the second floor. Enter Bethel and walk to the right of the large staircase and all the way to the back of the church, past the church offices. There will be a stairway on your left. Climb the stairs and our offices are to the left. 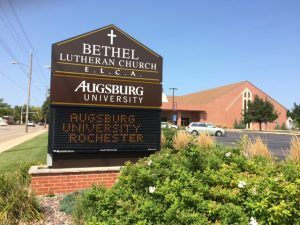 Augsburg University in Rochester, including its administrative and classroom spaces, is located at Bethel Lutheran Church which, like the University, was founded by Lutheran Norwegians and is affiliated with the Evangelical Lutheran Church in America (ELCA). For over 12 years, Augsburg University and Bethel Lutheran Church have been strategic partners, sharing a mission of service to the community and the world. This connection is one that both the church and the University celebrate and nurture as they reach to touch the lives of others at the local, regional, and global level.